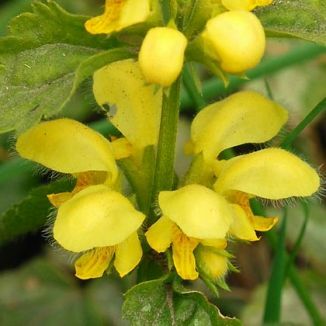 Yellow Archangel is not easily confused with other wild plants on this web site. 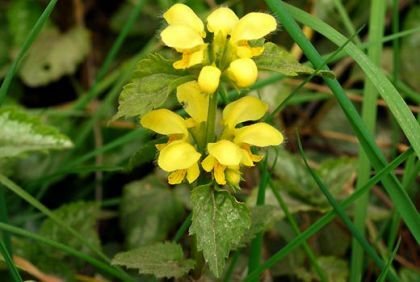 Creeping perennial of woodland and hedgerows, this handsome plant bears its bright yellow flowers in whorls on erect stems from April to June. The two-lipped flowers (20-25mm) are extremely attractive when viewed closely, with their upper lip somewhat hooded and fringed with hairs, and their lower lip streaked red-brown. The dark green leaves are narrow, lanceolate and stalked. The plant in the photograph is a subspecies argentatum and has variegated leaves which are quite attractive This plant is considered to be a garden escape belonging to the family Lamiaceae. I first identified the plant in the photograph in Ambrosetown, Co Wexford in 2007 when I took the picture. 16th century English herbalists said of Archangel plants: 'The chief use of them is for women, it being a herb of Venus'. It was also used to stop bleeding and to treat sores and ulcers.